Comics, generally, are written by middle-aged white guys, which is why their attempts to write teenagers is often so painful. You end up with kids using lingo that was out of date before the comic ever saw print, and it only looks worse as time goes by. For instance, Superboy. Superboy is a clone created by Project Cadmus to replace the Man of Steel, believed killed in battle with Doomsday. Unable to genetically engineer Kryptonian DNA, Cadmus instead bioengineered the Teen of Steel with genetic material from its late director, Paul Westfield. The young hero tends to think with his fists rather than his head, but tries to make Superman proud of him. Wow, how long ago was that bio written? Superboy was created by Tom Grummet in 1993. The bullplop about Paul Westfield came about in 1995. In 1996, a fan named Geoffrey wrote a letter to the company with a better suggestion: that the donor should have been Lex Luthor. They shot him down, but the fact that his last name was "Johns" - yes, that Geoff Johns - meant that in 2003, he was finally able to see his idea become canon. So for the packaging to use the version of the origin it does, Mattel has to have been sitting on it for at least seven years (because the alternative is that whoever approves the packaging lacks the ability to do even basic research). Superboy, who eventually took the name Kon-El, is built on a slender body; he's a teenager, so that's only natural. It's not the same used for Robin and Kid Flash - his torso is a bit smaller, so that he doesn't look oversized once his leather jacket is on. His arms are new for similar reasons: if they'd just used Mr. Terrific's arms, they would have been too big for the body. The Kid (at this point in his career/life, he hated being called "Superboy," but everybody staunchly refused to call him Superman) gets new shins, too, since the boots are fully sculpted. His belts and the inexplicable strap around his right thigh are separate pieces, as well. You could remove the jacket, if you wanted to, but there's really no point: his arms still have the sleeves, and it's not like the paint is right, anyway; the blue point on his back comes down low enough, but the one in front is too high; it creates an M shape that just shouldn't be. That error aside, all the paint is crisp, with no spills or blurring. The S shield on his chest peeks out of the jacket nicely, but if you want to get technical, the yellow shield on his back should be filled in, not hollow. 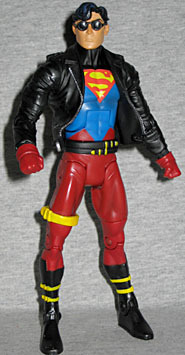 Superboy's glasses are held on by two small pegs that fit into holes in his temples. It certainly seems like they're meant to be removable, because the eyes behind them are fully painted, but the things seem to be glued in place. I had to dunk his head in boiling water to get them free. The face is good, though the expression is incredibly boring, and he's missing his earring. Articulation is what you'd expect from a DC Universe figure, with one important difference: his head. 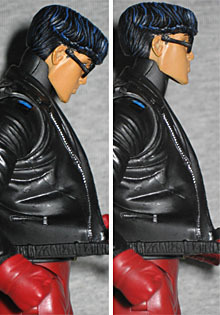 No, it's not another one of those with the screwed up balljoint that only allows the figure to look side-to-side. Mattel's corrected that at last, by putting a notch in the front of the neck that allows the joint to move forward the way it should. Nice, huh? Well, yeah, it is, but there's still a problem. Mattel, Four Horsemen, whoever designs the joints for these things, pay attention: characters who can fly need to be able to look UP! Yes, looking down is important, but up is even moreso. Fix it, already! Other than the glasses, Conner has no accessories. What he does have is a DC 75th Anniversary collector button, just like everybody else. His is... Clark lifting a tractor? How remarkably off-target. Of course, this is DCU13, the same series that couldn't tell the difference between Ted Kord and Jaime Reyes, so this is no big deal. Superboy's BAF piece is Trigon's left arm, a dark red limb with pearly white costume elements - a thin band around the biceps and triceps, and a thick bracer that covers the majority of his forearm. Does looking at these BAF bits make anyone else want a candy cane, or is that just us? 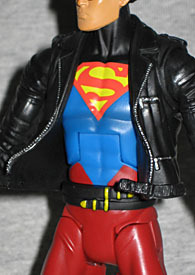 DC Direct made a Superboy years ago, and it's held up fairly well, but Mattel's version is much better. Other than the Kid's head, sadly - this one is just too dull, while DCD's had personality. Be careful if you want to remove his sunglasses, but you can finally complete your Reign of the Supermen collection, and that's a good thing.